There’s nothing quite like the sunrise from your own window, in your own home the day you leave for a long trip abroad. This is, I think, generally true, but all the more so if you’re going to be leaving your friends and loved ones for a full semester or an entire year. In my case, it was the latter. And my house has giant windows, which seemed the morning of September 12th almost to spite me as I left for the airport. The house has giant everything, if I’m honest, something of a symbol of American luxury that I can’t help but contemplate when I travel to Asia. I lived for a summer at a Buddhist monastery in Ningbo, China, and learned that this sense of bigness is hard to find in many personal spaces abroad. Though there are plenty of giant buildings, big streets, and big cities, personal accommodations in Asia are made for people of a much narrower stature than myself, and for people accustomed to being a lot closer to one another. It was that kind of knowledge that left me so excited, curious, and apprehensive about the adventure to Japan I was about to embark upon; and it was that morning’s sunrise, my girlfriend’s I’m-trying-to-be-strong smile, and the soft warmth of my dog’s fur that reminded me, yes, there were a lot of things it was going to sincerely hurt to be away from for a year. Part of me wondered, perhaps a little cynically, whether the trip was really worth such a sacrifice. But of course emotion speaks in that primal language, and a larger part of me knew that what was to come was something I’d spent the better part of a decade preparing for. This is my future, for better or worse, and when I’d decided to go back to school in pursuit of an Asian Studies degree, this was already part of a loose plan I’d mapped out for myself. So after a slow, tearful, reluctant farewell with my beloved, I boarded the plane that would take me to a place I’d never been before that I would soon begin to call home. Narita Airport wasn’t what I expected. It bore more of a resemblance to the Shanghai Pudong Airport where I’d flown en route to Ningbo than it did LAX. It wasn’t as big as I thought it would be, and felt crowded and dirty. I realized that I’d never even seen pictures of it before. So as I scrambled to fill out immigration documents and stood in a long line of other foreigners, mostly from other parts of Asia, I had to remind myself that I too had foolish prejudices. I thought of Japan as modern, clean, organized, and above all more polite than we’re used to in America, but those concepts were in many ways just stereotypes, and the reality was that no matter how generally familiar I was with Japanese culture from afar, via TV, comics, friends, and reading about Japan’s history, this was my first time to ever visit the country. I checked my expectations, took a deep breath, and walked on through the line. Even my checked expectations would prove unrealistic. On top of the general feel of the airport (which did at least function in a very organized and polite fashion), when I was taken aside to get my residence card with a couple of other foreign students, we were taken to a small, dirty, poorly-lit back room where a pile of children’s toys sat next to an old crib, and various worn-looking paper signs in Japanese and English adorned the wall, cautioning us against a variety of prohibitions. While I waited to be processed, an unhappy native Japanese traveler rather noisily informed the staff of her dissatisfaction with some element or other of her recent treatment, and there was a continual shuffling of airport employees as they attempted to resolve her issue and figure out how to process me and another student. After getting my resident card, crossing through customs, and retrieving my errant luggage, which was no longer on the carousel due to the length of time it had taken me to get through, my expectations had another challenge: trying to figure out which train to take to get to Kamakura. When I finally navigated what the best cost-to-effort ratio was through much consulting of my phone, and finally located where my chosen train was to depart, I had to actually buy the ticket, a process that involved a small piece of paper that a wandering ticket sales employee helped me fill out while I stood in line. I brought the paper to the the man at the counter, who hemmed and hawed a bit before finally giving me my final total. It all seemed weirdly imprecise. I took my train without too much added difficulty, and figured out how to buy a local ticket at a terminal in Ofuna Station. I stood in a wobbly, charming monorail car next to commuters of all types for the short distance to Kamakura, where in the dark and intermittent rain I dragged my luggage another ten minutes to my hostel. It was a different first vision of the country than I expected to have, especially given how much I already felt I knew about Japan. But what I knew had, of course, been filtered through an endless screen of cultural filters: media outlets selected only the best and most interesting stories, other people had shown me their best pictures and told me their least-mundane stories, and even friends from Japan had talked more about cultural differences than mechanical ones. Everyone’s seen about a thousand meanwhile in Japan memes, ranging from jokes about the questionable content in some anime and manga (read: cartoons and comics) to jokes about the eccentricity of certain citizens or oddities of cultural practice, but those are mostly false-positive stereotypes. 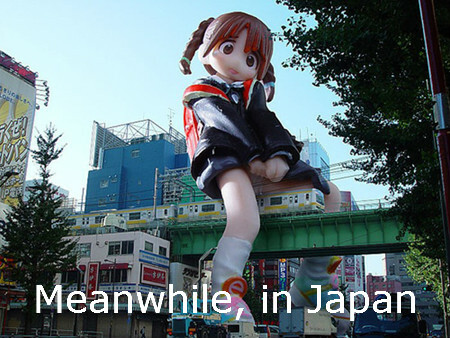 Put simply, Japan isn’t that weird. If you took a sampling of the weirdest stuff in America or any other country, you would end up with similar memes, all while having to acknowledge that few of them reflect daily life. Whatever we think we know about a country is a heady mixture of the assumed, the relayed, the exaggerated, and the misconstrued, and so wherever you may be headed, expect to have your expectations overturned, even (or perhaps especially) if you think you know so much about the place that you’re the exception. The streets of Nagoya at night. This is probably what most people expect Japan to look like. One of my mentors at my home university has told students to avoid overly simplistic and overreaching thesis statements in their papers, often saying, “Don’t tell me that the differences are different, tell me why they’re important.” That advice seems to apply equally to writing this article, but in attempting to implement it, I’ve run into the problem of the fact that Japan is both different and not all that different from my home country. Insubstantial or surface-level differences aren’t hard to find, but it doesn’t take long to realize that there are still streets, sidewalks, convenience stores, big-box stores, Italian restaurants, office buildings, and laundromats. The cars drive on the left side of the road, as once upon a time Japan took some of their modernization blueprints from England, there are vending machines almost everywhere you look, and it can be hard to find public waste receptacles because of Japan’s ideology that people should be responsible for their own garbage, but these sorts of immediately noticeable differences become window dressing in short order. Larger differences might be, say, registering at a local municipal office if you’re becoming a resident. This is not an especially English-friendly process, and thankfully in my case I had a fellow student from Shinshu University to assist me. I’m currently living in Matsumoto city (松本市), and after settling down in my university apartment I needed to register with the government and open a bank account. So my companion picked me up and we took the bus over to Matsumoto’s local shiyakusho (市役所) or City Hall. We filled out at least 4 different forms via at least 4 different windows, which included some sort of insurance desk and something about the Japan Pension Service, and I was fingerprinted. In exchange for this process, they gave me a massive packet with a guide to the city, coupons to local museums and attractions, a map, and schedules for local transportation. This was all decidedly Japanese, including the bustling, crowded, and organized office in which it took place. And, as also seems par for the course in Japan, despite having received numerous explanatory papers, I was still very confused about many things, but was also glad for the friendliness extended to me not just by the employees and my assisting student, but also the system itself. I would venture to guess no local municipality in the U.S. has such a comprehensive package to give their long-term visitors from other countries. My apartment has been another adjustment, though it’s easier for me than it might be for someone else, given that I’ve traveled around Asia staying in hostels. The apartment isn’t entirely unlike a good hostel, in fact: it’s small and old, but clean and (mostly) functional. Japan, as any visiting gaijin (foreigner) can tell you, is not built for large people. So it follows with the average Japanese apartment. It’s ostensibly just one room with a small bed, and what amounts to a hallway with a kitchenette on one side and a door leading to a tiny bathroom on the other. There’s a balcony, which is common practice almost everywhere in Asia since you’d be hard-pressed to find someone who owns a machine for drying their laundry. My front door uses a key-card style key, which is a small, metal, rounded-rectangle of a thing that fits into the front part of a two-segment doorknob. Once inserted properly, the front part of the knob can be rotated right or left to unlock or lock the door, and if unlocked, the back part of the handle can be turned as you would expect. The tiny bathroom has been something of a challenge given that I’m six feet tall, and learning the ins and outs of the small gas range took some time. The range isn’t a full oven, but just a big slab of a device hooked up to a gas valve, resting on a cabinet, with two burners and a small oven-like tray in the center. I didn’t initially realize that using it required manually turning on the gas valve at the wall every time. Hot water isn’t dissimilar: for hot water either at the tap or the shower or bath, you have to use a small unit that looks like a home air-conditioning panel. This will allow you to turn on the boiler and set the water temperature, though we’ve been cautioned not to use it for more than 30 minutes, or it may get turned off and require that we call someone to turn it back on. Beyond these sorts of mechanical adjustments, my familiarity with Japan has kept the culture shock to a general minimum. I feel quite comfortable here on the whole, and yet it’s still been an emotional experience, with some highs and quite a few emotional lows, the latter mostly due to occasional loneliness and feelings of isolation, missing my family, and most especially missing my girlfriend and my dog. If there is one huge challenge I feel I have to overcome, it’s living without those closest to me for an entire year. My dog is a pit bull I rescued from the streets of Texas around 6 years ago, a giant softie sweetheart that is probably the closest thing I’ll ever have to a child. My girlfriend and I got together only one year before I left for Japan (and she’s not Japanese, if you’re wondering), which makes the year apart even more of a strain than it might normally be. Humorously enough, the one thing I said I wouldn’t do was get into a relationship before I left—life has a way of mocking our plans. Tiny washing machines and air-drying the laundry are par for the course in Asia, and Japan is no exception. But I made a conscious effort to make this trip happen. From six months filling out countless scholarship applications and asking my beleaguered professors for countless letters of recommendation, to all the preparation that goes into leaving one’s home for a year, to talking to my girlfriend about what I was doing to make sure we had open lines of communication and were on the same page, nothing I did was anything less than a whole-hearted, conscious choice. Because I knew that this is what I wanted to do. It’s been something I’ve wanted to do for years, because I love the language, I love the people, and I wanted to do something that would allow me to grow closer to them both. The challenges, two weeks in, have already been many. My Japanese is considerably less than adequate for anything beyond everyday tasks. I can buy things in stores, exchange money, wish people good morning and ask them basic questions about themselves, in addition to answering basic questions about my own experience, but more complex instructions are still difficult, and I’ve had to cope with the realization that I am a much longer way from real competency than I’d imagined. The placement tests for language study at my Japanese university were humbling. Frankly, I’d never been more embarrassed to turn in a test in my entire life. Out of all the (as I thought) complex grammar that I’ve learned, none of it whatsoever turned up on that test, only some basic stuff, then a pile of things I’d never seen, which might as well have been gibberish. Kanji, the complex characters imported from China that represent one of three different writing systems in the logo- and syllabo-graphic totality of the written Japanese language, went a little bit better, and I was fine with the more basic reading and comprehension material, but the rest of it was just rough. To be fair, the test is intended to gauge proficiency all the way from total beginner to the level of someone who could do graduate coursework in the language, but I had hoped I was at least a little further up the scale than I turned out to be. These are the kinds of places that even a small degree of language ability can make a lot more accessible. Learning a new language is hard work, but well worth it. No matter. I didn’t just stumble into this gig on a whim, nor did I study for the last decade (with a few long gaps) just to let my pride get in the way of the end goal of Japanese fluency. If I haven’t done as well here on my first outing as I might have hoped, that just means I have that much more reason to buckle down and give this the attention it deserves and demands. I have a year. It’s a long time, but it’s also a short time—when it comes to something like the lifelong experience of learning a language deeply, there’s no room to squander any of it. And that’s an important point. I am committed to what I am doing, and to the sacrifices I’ve had to accept in order to make this opportunity a reality. Anyone studying abroad owes it to themselves to ask questions about their motivation, and what they hope their end goal will be, not only because it helps at the outset to make plans and manage expectations, but because it can constantly remind you of what you should be doing at any point along the way. It’s easy to fall into numerous social and academic traps when studying abroad: hanging out with other foreigners, using too much English, not studying enough, or studying too much and not going outside and talking to people are all good examples of how you can throw away what you’ve worked so hard to achieve. So every day here has been a choice. It was a choice to find the last bus to Eiheiji Temple from Fukui Station where I was seemingly the only foreigner for 200 square kilometers. It was a choice to stay in an apartment outside of the International House that my host university makes available to its exchange students. And it was a choice to leave behind so much that is precious to me in order to truly experience life in another part of the world. Because nothing worth doing comes without some sacrifice, whether that be of time, effort, or presence. Every morning, when I see the sun rise over the mountains between Nagano Prefecture and its neighbors Gunma and Saitama, I am reminded of this, and of why it’s important. I chose to be here, and the only one who can make the most of that choice is me. Matsumoto City, my home for the next year.